It’s not often we go to Italy. And it’s not often we feature mopeds, either. 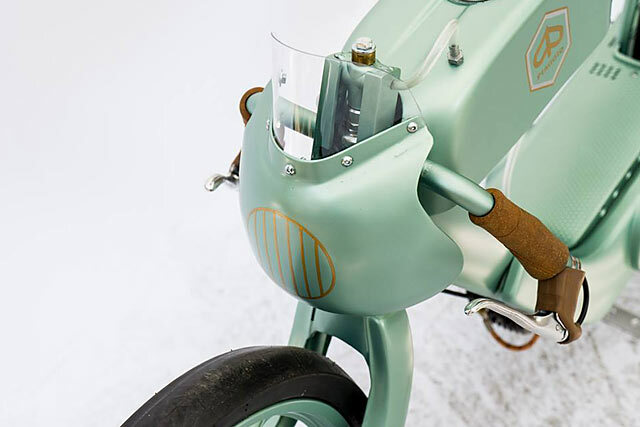 Hell, it’s not often that a bike goes largely unnoticed by our crack team of moto-loving freaks. But that’s exactly the perfect storm type scenario that unfolded on our recent trip to the continent. 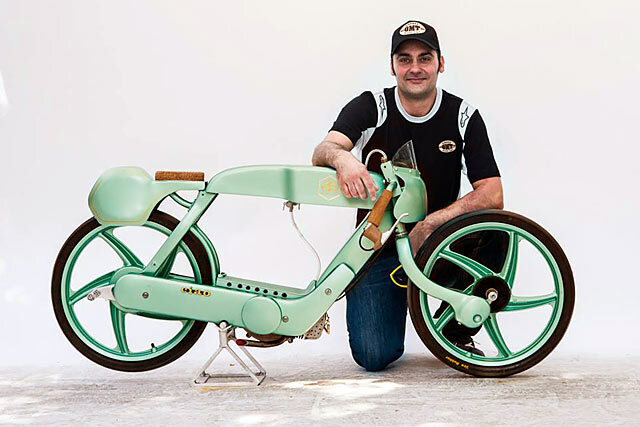 Last month, Marco and Mario from Italy’s talented OMT Garage flashed us a phone photo of his Deus Bike Build-Off winning ‘Silhouette’ Piaggio Ciao. With our focus on the show’s larger capacity offerings, we clearly let this little green gem slip under our radar. But now, many months later, we’re smitten. And not a moment too soon. Impressively, the OMT brand was born in 1978 from the mind of the boy’s father, Gaetano. Instilling a combination of moto passion and technical innovation into the business, the two young brothers pretty much grew up in the shop. And since they have taken over the reins, they have transformed the company into a modern and now famous moto garage. Famous, because the brothers managed to win Italy’s inaugural Lord of the Bikes reality TV show in 2016. But why a moped, you may ask? “As with most Italians, a moped was the first motorcycle my brother and I had when we were 14 or so,” says Mario. “This is probably why Marco and I felt we had to honour it.” The bike is a 1982 Piaggio Ciao PX. Or, more correctly, it was a Ciao. 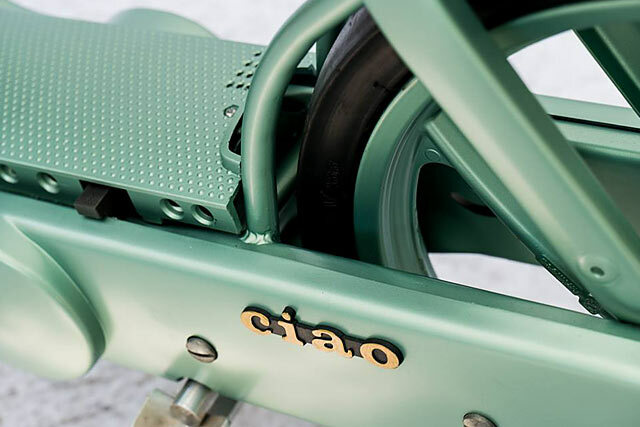 With its newly reinforced and modified chassis, bespoke tank and racing fairings, it’s now the Ciao’s long-lost, speed freak cousin. 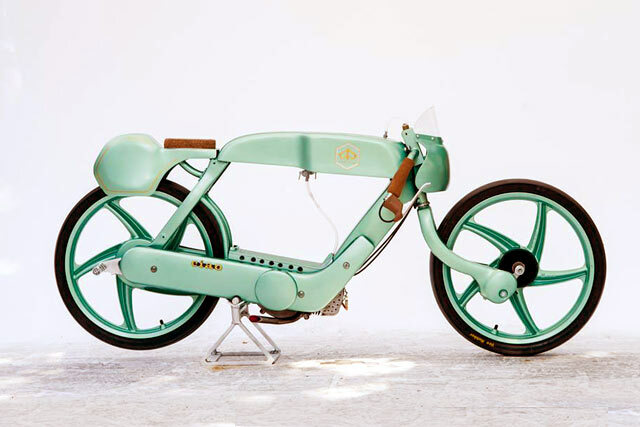 Designed for racing, the bike’s final shape is low and slender, hence the name ‘Silhouette’. Lengthened to add stability at speed and lowered to have the best aerodynamic cross-section, the bike’s aluminium fairings and tail-piece sits close to the bike’s wheels for the lowest possible profile. 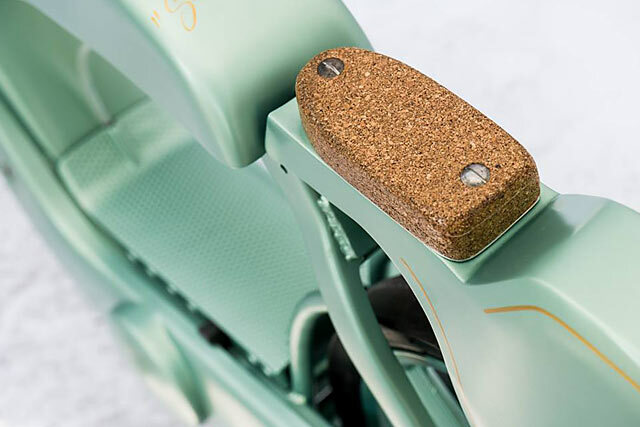 A nicely retro and ridiculously light cork saddle and a tiny hand-made tank were added to further reduce the weight to the absolute minimum. Just beware of those crosswinds. Piaggio Ciao fans (there has to be some out there) will notice that the lower part of the chassis is almost the same as the original unit. Mario notes that this was on purpose, as it’s the most identifiable part of the bike’s original design. Lose that, and it just ain’t a Ciao any more. And the hardest part of the job? 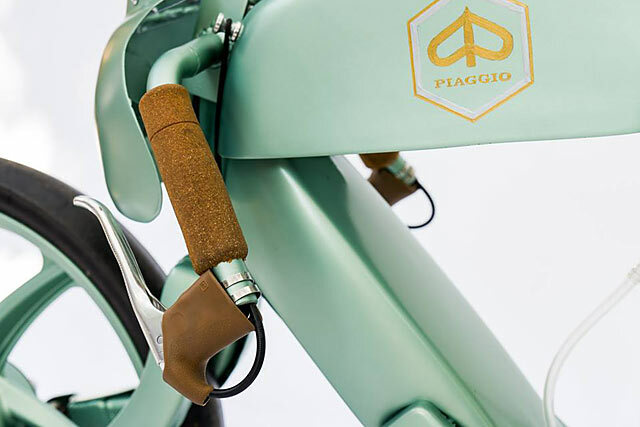 “Modifying the front fork to get the perfect, rounded shape we wanted took almost 40 hours to get right”. 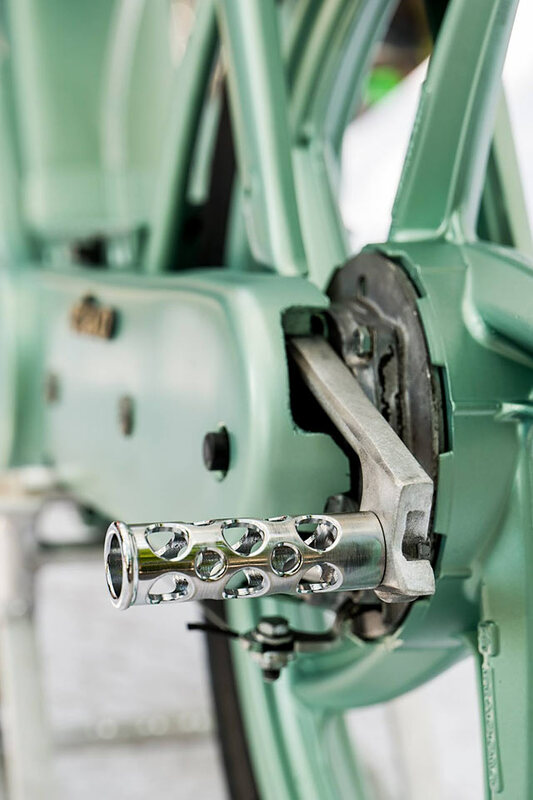 The boys went to town on the little two-stroke, increasing it’s capacity to 75cc, up from the factory’s 49cc, adding electronic ignition, a 19mm carb, a hand-made exhaust and a lightened flywheel. Add to this some genuine slick tires (we never knew they made them that thin) and the race is almost won before its run. With the from brake now removed, there is only the rear brake to stop you after you cross the line. It’s activated with the lever on the left of the bars, while in an interesting variation on the normal state of play, the lever on the right manages the throttle. All up, the boys spent a very fruitful two weeks building the bike for the show. 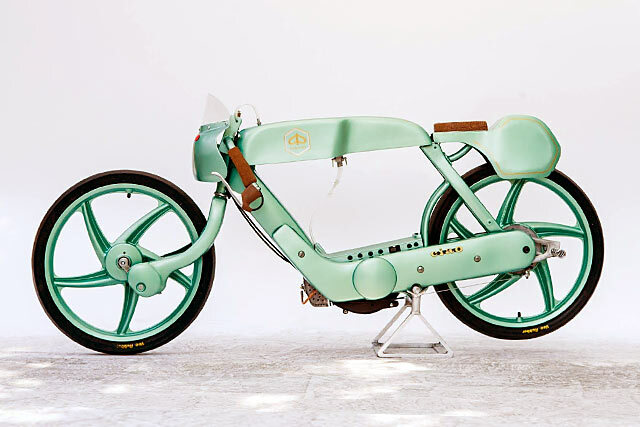 For one of the nicest moped we’ve ever seen, that’s got to be time well spent.